Scholastic.com provides the following helpful information about this lesser-known holiday. (In the state where I grew up, we always had school off.) In addition to telling your kids a bit about about Christopher Columbus, you can find short quizzes here and here. Also, here are some coloring pages for your kids to work on today. The holiday honoring Christopher Columbus' sighting of America on October 12, 1492, is observed in the states of the United States and also in parts of Canada, in Puerto Rico, and in some cities in Italy and Spain. 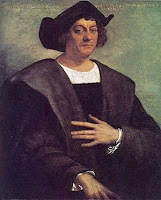 Although Columbus was not the first explorer to set foot in the Western Hemisphere, his landing at San Salvador Island in what is now the Bahamas was very important. It opened the way for the settlement of America by Europeans. It is probable that the first celebration honoring the event was held in 1792. Columbus Day became a legal holiday in the United States in 1892, 400 years after the famous voyage. It was then called Discovery Day. Many cities and organizations sponsor parades and banquets honoring the holiday. October 12 is celebrated in Latin American countries not only as Columbus or Discovery Day, but also as the Day of the Race (El Día de la Raza). It honors the many different peoples of Latin America. Schoolchildren in the larger cities parade. Fiestas, sometimes lasting several days, are held in the areas with large Indian populations.